What is the difference between Vented and Sealed Gauge Reference Pressure? After clarifying the different types of pressure measurements and the difference between absolute and gauge, it is time to expand and discuss the two types of gauge pressure; vented gauge and sealed gauge reference pressure. Remember a gauge pressure reference is relative to current atmospheric pressure. The reference pressure in a vented gauge sensor allows atmospheric pressure in and out of an area behind a diaphragm through a vented path. Since the outside atmospheric pressure is applied to the diaphragm, via vented cable or a pourous surface in a housing, the sensor measures pressure relative to ambient barometric pressure. 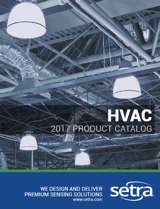 The main advantage of a vented gauge sensor is that the sensor will always nominally read zero when pressure is released, no matter how atmospheric pressure changes. This is particularly useful in low pressure ranges where output is significantly affected by atmospheric temperature changes. The reference pressure in a sealed sensor refers to atmospheric pressure trapped within the back of the diaphragm, with no vent path for pressure to flow in or out. Since atmospheric pressure constantly changes due to weather and temperature changes, a sealed gauge transducer will never read an exact 0; the atmospheric pressure is sealed in at approximately 14.7 PSI (at sea level). 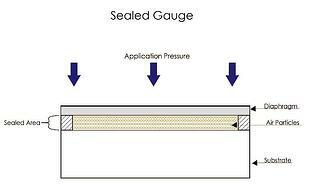 Sealed gauge pressure is the best approach for applications with a high pressure range and a consistent temperature. For example, in hydraulics the temperature changes will have a minimal effect on the accuracy of the reading; since the effect of the expanding and contracting air is negligble due to the high pressure range, so venting is not necessary. A sealed gauge can also for be used for protection in high pressure applications where a manufacturer wants to provide secondary containment for high pressure in cases where the diaphragm faces overpressure. It is also suitable for applications where it is not possible for the sensor to provide a vent path. For example, a depth sensor mounted inside a submersible vehicle containing no vent tube to the surface but needs to measure depth relative to a nominal atmospheric pressure. CLICK HERE to learn more about Setra’s gauge transducers.